Gas station managers oversee the daily operations of gas stations and act as leaders for the station’s employees and the assistant managers who work under them. Gas station managers also set employee schedules, manage fuel/inventory shipments, hire/train/fire employees, create the station’s budget and coordinate with the station’s owner/corporate management. In addition to administering the operations of gas stations, gas station managers must ensure that safety and security protocols are met by customers and employees, and that fuel prices are set correctly each day according to market conditions, to beat competitors and to meet management requirements. 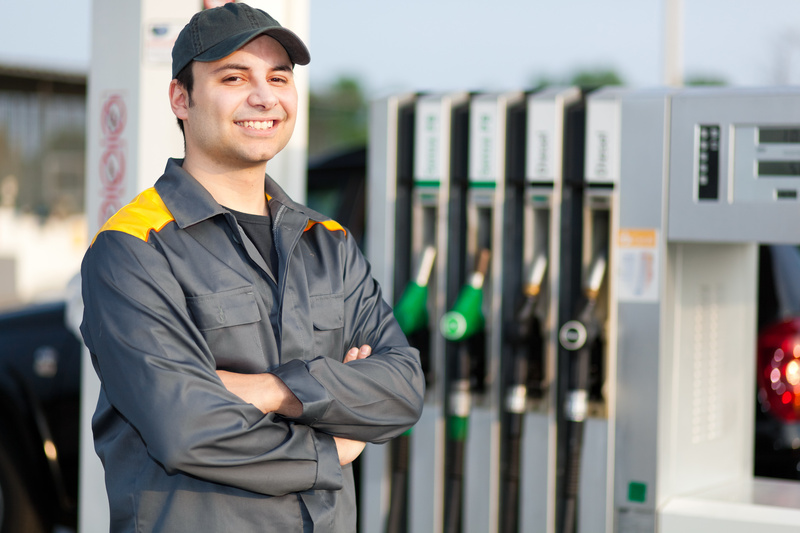 No matter the size of your station or the products/services you offer, your gas station managers are responsible for the entire operation running smoothly and ensuring the needs of customers and employees are met. You can use this gas station manager job description to help you create a job description for the next gas station manager job opening you have or to help you more clearly define the role of an existing manager. The range of pay for gas station managers is $9 - $16 with an average of $13/hour. This gives gas station managers an average annual salary between 20,000-47,000. Some gas station managers are paid bonuses for meeting sales, safety and other performance benchmarks. Some gas station managers are also given commission for sales of certain items or for total sales at their convenience stores. Because gas station managers typically work long hours, overtime should be expected for people in these roles, and this overtime pay is often a large factor for candidates. You can use this gas station manager job description to help you create your own. We’ve created a fictional station that sells locally made hot food and souvenirs to tourists, as examples of gas station operations that make a gas station manager position different from a default gas station manager job description. Remember to consider what makes your gas station different from others (products sold, customers, location, etc.) when creating your own gas station job description and when reviewing any gas station job description resume you receive from applicants. Must have managerial experience (gas station management experience preferred). Roy’s Station is an independently owned gas station located in Gainesville Florida and has been in operation since 1978. By emphasizing customer service and providing home-style food options and hand crafted curios in our convenience store, Roy’s Station stands out from corporate competitors in the area and is a pillar of the local community. Roy’s Station is also a popular stop for tourists traveling down I-75 on their way to destinations such as Orlando, Palm Beach and Miami. The Roy’s Station manager is responsible for ensuring consistent, compliant and profitable operations at the station, with the goal of increasing profits over time. The gas station manager is expected to source and market convenience store merchandise, manage relationships with souvenir vendors, ensure consistent food service quality, improve employee productivity/customer service, maintain and increase revenue, create and manage expenses according inventory/payroll budgets and ensure positive customer experiences at all times. Gas station manager duties ensure the continuous and compliant operation of their station, and range from for ensuring high qualities of customer service to continuous compliance with company, local, state and federal requirements for gas stations. Oversee, plan and manage operations of Roy’s Station. Manage 3 full time assistant manager and 6 part time employees, oversee employee performance, mentor employees to improve performance over time, identify potential for supervisor and manager roles in employees. Ensure that all food served at Roy’s complies with state and local health codes. Maintain positive relationships with local vendors of handmade souvenirs. Hire employees, train new hires and fire employees who do not meet requirements. Report new hires to the state government within the required timeframe. Determine staffing requirements for the station and determine whether seasonal hires will be required at any point during the year. Create employee schedules, ensure all shifts are covered and adjust these schedules to accommodate employees when possible. Use market research to capitalize on consumer trends, to determine expected sales volume for new products and to set competitive prices for Western Gainesville, FL. Maintain beneficial relationships with current convenience store distributors and forming new relationships with distributors when advantageous or required by the ending of existing relationships. Make decisions on all products sold and services offered with the goal of maximizing station revenue. Implementing and managing the station’s credit policy. Selecting the station’s POS technology, providing support and training to employees in using POS technology. Selecting the station’s inventory management technology, providing support and training to employees in using inventory management technology. Creating and executing marketing strategies for high-margin items, locally created souvenirs, items prioritized by distributors and other high priority merchandise. Create and manage customer loyalty and rewards programs. Research and source merchandise for resale and management of resale certificates. Plan the Roy’s Station budget and authorize expenses according to this budget. Manage customer complaints and oversee the resolution of these complaints. Ensure that all local, state and federal requirements for lawful operation of the gas station are met by all employees and customers. Oversee the reporting of employee hours, manage payroll and payroll taxes. Create payroll reports (new hires, all employee hours logged, changes to payroll, terminations). Ensure that employee conduct standards are met at all times and implement the company’s disciplinary policy with written warnings and terminations. Ensure that safety protocols required for gas stations are followed at all times. Ensure that security protocols, such as maintaining small amounts of cash on premises, are followed at all times. When you create your own gas station manager job description, remember to list requirements that are unique to your gas station, as well as requirements that would be true of any gas station manager. For more useful resources for gas station and convenience store owners, you can check out other articles on the CStorePro Blog.